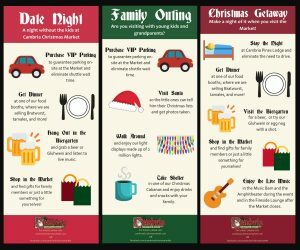 There are so many different things to do when you visit the Cambria Christmas Market! We want to make sure that you get the most out of your visit, so we advise you give yourself 2 to 3 hours at the Market! Check out our Itineraries for suggestions on how to spend your time at the event. Are you coming for a date night, with grandma and grandpa, or travelling from out of town? Follow these or pick and choose for yourself, either way, we know you’ll have an amazing time!